Today digital map has become integral part of everyday life. Most organizations have data with geo attributes in some form or other and the need to understand geographical significance of data has been on the rise. The combination of aggregating information with location and presenting them in a small space allows Map visualizations to present the big picture out of sea of data. They help you find the theme and outliers at a quick glance. While a 2D map can help achieve this goal to some extent, when it comes to multiple attributes and widespread data, they fell short. A 3D Map makes this experience more immersive and magical. They provide the sense of connection to the data with the physical world. This, combined with our spatial ability, brings a new perspective to the data when we present them as 3D objects. GlobeMap brings this magical map exploration experience to Power BI. To use, simply import the Globe Map from the Visuals gallery to your Power BI report and use it with a location data type. The location could be an address, city, county , state/province or country/region. On this 3D map, you can project a measure as the height of the bar. The 3D bars reduce the clutter of overlapping bubbles and allow you to get instant insight. GlobeMap also allows you to rotate the Globe and see it from different angles. But we didn’t just stop here. We added one more goody to this visual. The icing on the cake is the added benefit of heat map in this visual. You can use a second measure for heat intensity and draw immediate attention to the right areas. For many mapping solutions, some location names may be ambiguous, when considered in the context of multiple countries or regions. You can increase the accuracy of geo-coding of such location names by concatenating the city, state and country. For example, instead of using just ‘Bellevue,’ as the location you can provide it as ‘Bellevue, WA, USA’. As usual, we can’t wait to hear your thoughts and your ideas for improvements. NOTE: This Globe Map custom visual is not the same as Power Map for Excel (called 3D Maps in Excel 2016). Power Map is a 3D data visualization tool for Excel that lets you plot geographic and temporal data visually, analyze that data in 3D, and create cinematic tours to share with others in Excel. 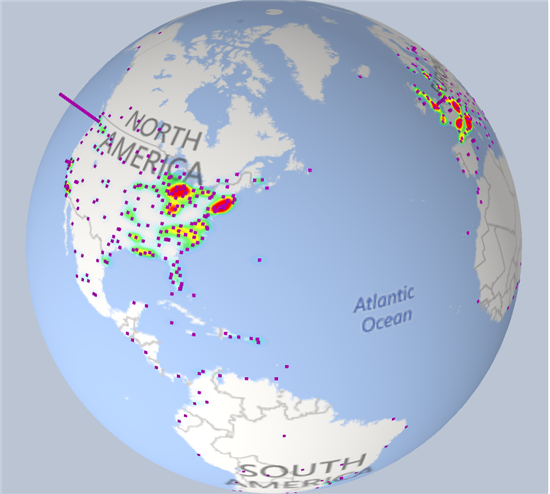 Globe Map is a custom visual for use within Power BI reports. Sign up below to get the latest from Power BI, direct to your inbox! By clicking Sign up today, you are giving your consent to Microsoft for the Power BI newsletter program to provide you the exclusive news, surveys, tips and advice and other information for getting the most out of Power BI. You can unsubscribe at any time. Microsoft Privacy Statement.